February is here and already the days are noticeably longer, and until this week colder, now it looks like windy and wet weather are on the way. In my garden this delightful shrubs is in full Bloom. 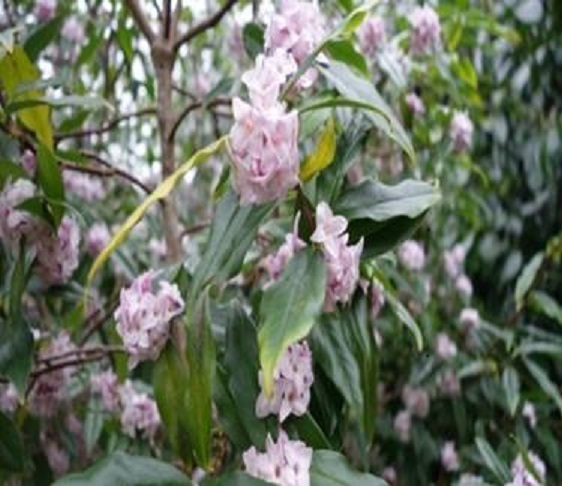 It is fragrant and mine planted in a sheltered patio area gives off a nice fragrance as you walk past. This is a delightful upright evergreen shrub, providing colour at what can be a dull time of the year. Easy to grow really in any fertile soil, sheltered area is best, does not like to be transplanted so give careful thought to where you plant it. Slow growing very little pruning is required. Hardy throughout UK – RHS H4. During this month check through all the seed you have collected for any Plant Breeding Projects you are working on or have planned. During bad weather check through catalogues and online to see what new plants are being introduced this year. Helps when making comparisons with plant breeding plans you may have. Full Plant Protection applications processed in UK, EU, and other world territories. Mother stock build up, Plant propagation and virus testing available. With UK leaving the EU, a Procedural Representative will be needed for making PBR Applications in Europe, I have access to a company in Europe so can easily assist in making those PBR Applications, including sending plants to testing stations which going forward will not be in the UK. Snowdrops and Crocus will be up now and most likely in flower. Carry on clearing branches and twigs from any recent storms, good idea to check fences and property borders for damage. Trim shrubs that have finished flowering. Towards the end of the month ideal time to prune hybrid Tea roses and floribunda, cut away any dead or diseased stems. Make cuts at 45° angle. Plant bareroot hedges, like Beech, blackthorn, hazel etc. Soak roots for at least an hour before planting. Can also plant container grown. February is also the month to prune buddleia, Spiraea japonica, tamarisk and hydrangea (Hydrangea paniculata). If you have plants in containers then these will need still to be checked for watering, keep them raised to aid drainage. Remove any twigs and branches. Clean out waterfalls streams, remove any branches and debris. For veg garden finish any deep digging. You can cover some of garden with polythene or cloches to warm up soil for early sowings. Early sowings under cloches can be made of Carrots, Lettuce, Radishes, Salad Onions and Summer Cabbages. Plant shallots now, plant quite deep to prevent birds pulling out them out. Start chitting seed potatoes if you did not do last month. Jerusalem Artichokes can be planted now, relative of sunflower, very tough will survive in the poorest of soils. If growing peppers and tomatoes from seed you can start these now in a heated greenhouse, take about 3 weeks to germinate. Enjoy the Garden, get out there as much as you can during this month, spring is well underway.